Boiling water taps and hot water taps are perfect if you’ve got a need for steaming supplies of aqua at a moments notice. It’s like having a kettle that’s always on, but without the time factor involved while you wait for the old-school appliance to boil. It's also a considerably classier option than an instant hot water kettle, useful though they are. While some boiling water taps and hot water taps can replace the arrangement you currently have in your kitchen others are more of a supplement to an existing tap layout. Either way, they’re great for making instant cups of tea and coffee, as well as being invaluable for faster food preparation. If you’re considering a move to a boiling water or hot tap setup then we’ve got some prime examples in our guide below, including the Grohe Red, which is our top choice. The obvious benefit, aside from unlimited quantities of instant hot water, is that you’ll no longer need a kettle or the space that used to occupy. Keep an eye on the temperature capabilities of the tap, as boiling water taps might take the water temperature right up to 100ºC, but it’s more usually served at 98º-99ºC. Settings can often be adjusted, however, although be sure to check what the hot tap is able to do before plumbing it all in. 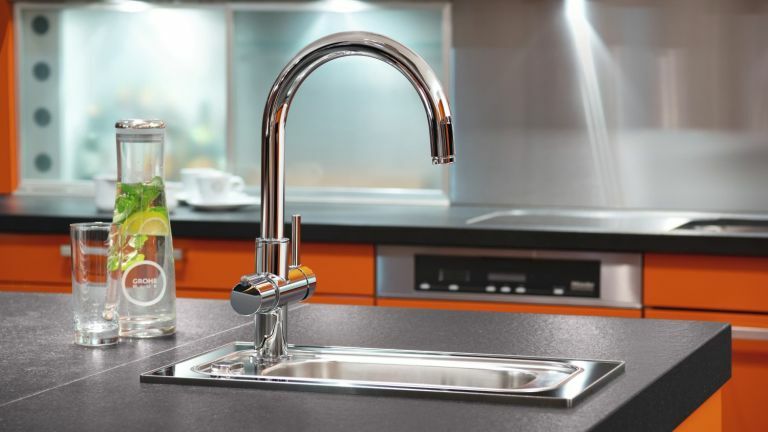 Boiling water taps and hot water taps are also expensive, and they do require some space, usually underneath your worktop for the kit that comes with them. A water supply and a three-pin plug socket both need to be in close proximity. The associated hardware could include a small boiler/water tank and a filter too, so if you’re not great with DIY it might be best to get a professional to fit it. The filter, incidentally, can help prevent limescale, but will need replacing over time so keep an eye on replacement costs for that too. And what of running costs overall? Boiling water taps and hot water taps are a premium purchase, so there’s quite a lot of initial outlay. However, Quooker (whose Fusion model is shown below) says that their boiling water taps can cost 3p per day to run on standby. A conventional kettle costs, on average, about 2.5p per boil. The Red Mixer Tap from Grohe comes in four different models. The duo features a hot water tap design that also has a regular hot and cold tap on the other side. The mono model, meanwhile, is just the hot tap and you use it alongside your existing tap arrangement. You can also choose from either a 3 litre or 5.5 litre boiler, depending on requirements. You will, however, need space in your kitchen cupboard to allow for this to be installed. There’s a hugely practical two-step, child-safe process for dispensing the hot water, which means it’s brilliant for anyone with a family. The design and build quality is also hugely impressive. The Franke Omni looks almost like a regular tap design but you soon discover that it’s got lots more going for it than that. It can deliver water up to 100°C, and lots of it too thanks to a 4 litre tank. We also like the way it’s pretty straightforward to install. If you’ve got a family then you’ll approve of the child lock, while the design itself is easy to use, no matter if you’re right or left-handed. You get an alert when it’s time to change the filter and the splash-proof function comes into its own when you’re filling up pans for cooking. You get a lot for your money from this respected brand. If you’re getting bored of conventional chrome then the Abode PT1105 Pronteau is a great alternative as it comes in a range of finishes, aside from the normal shiny silver. In fact, you can get one to suit the style of your kitchen. The 2 litre water tank isn’t the biggest, but that does mean it’s ideally suited to smaller households. There’s hot, cold and filtered water on tap up to temperatures of 98ºC while the full 360ºC rotation makes the Abode very practical in day-to-day use. You’ll also find that the Abode PT1105 Pronteau is one of the more keenly priced boiling water taps out there, which adds to the overall appeal. Qettle’s 4-in-1 Instant Boiling Water Tap is impressive in that it can supply up to eight cups of water, either cold, hot or up to 100ºC almost instantaneously. The four-litre tank capacity is decent while the other bonus here is that reheating it takes just 10 minutes. We’re also fans of the tap clip that keeps it safe from curious children and another positive is that the replacement filter cartridges are recyclable. You’ll get a handy notification from the LED display on the tap when they’re due to be replaced. Admittedly, you will need to get a plumber to install the Qettle 4-in-1, but with anything involving water that’s probably a good thing. Nevertheless, this comes keenly priced and provides you with water right on up to 100ºC. We love the name of this filter tap, but it’s also a compact and practical solution if you’re after a do-it-all model that won’t be too obtrusive in your kitchen. It serves up hot water at a not-quite-boiling 98ºC, but also functions as a competent hot and cold tap too. The build quality and the overall look and feel of the Insinkerator suggests that it might be more premium than you might initially think. That’s a definite positive. There are some compromises to be had from the Insinkerator though. Its 2.5 litre tank isn’t the biggest but on the upside, along with the compact design, that makes it ideal for small homes. You can almost sense the quality heritage of the Quooker Fusion, which sports a minimal, clean design that suggests no frills and no fuss. However, the Fusion is big on neat features. Crucially, this 100ºC boiling water tap is super safe thanks to its double push and turn switch, while it also serves up your steaming aqua via an aerated spray for extra reassurance. You’ll also love the red warning light ring that lets you know the water is being boiled and/or dispensed. Add in a cold filtered drinking water option and you’ve got a versatile tap that can do it all. Getting a Quooker boiling water tap installed might be a bit more involved due to the way you need to choose the tank size. The benefit though is that you can better tailor it to suit your requirements.